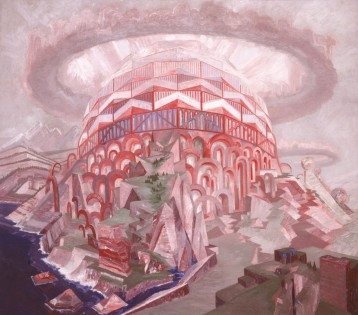 Utopian architectural designs, expressionist interiors, fantastic worlds of colour – all of this is only a fraction of the work of Wenzel Hablik (1881-1934), who dedicated himself to a synthesis of the arts as a universal artist. Hablik is considered one of the most important representatives of the German expressionist avant-garde in architecture and design. Even if the paths of modern art seem extensively researched his work still offers up surprises. The focus of the exhibition in Berlin is comprised of his architectural visions and his colourful 1923 masterpiece of spatial concept as reconstruction. These are complemented by the presentation of paintings and designs, as it is in combination that the basic idea of the synthesis of the arts as pursued by Hablik first becomes comprehensible. This is the first extensive solo exhibition of his work in Berlin.